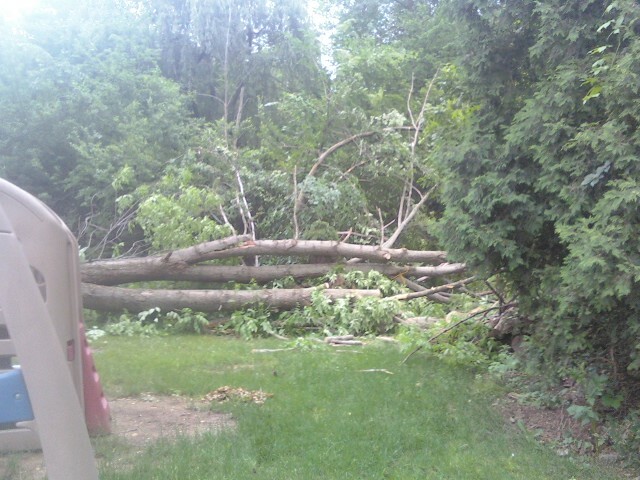 The neighbors who have moved to Indiana and have their house for sale, had a tree come down across their driveway. I told them that I'd clean it up if I could have the wood. 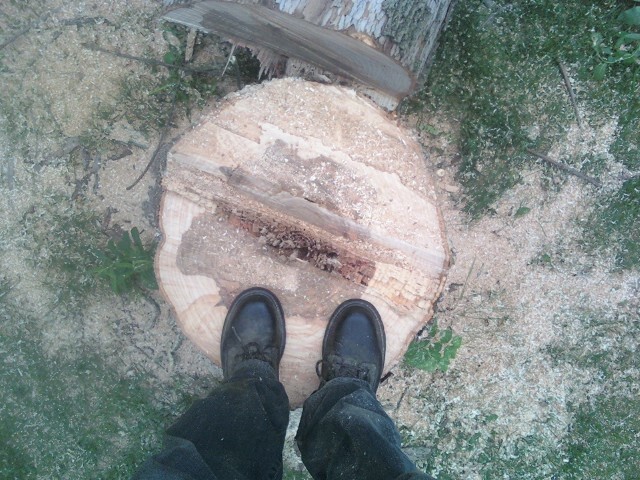 Alex & I started cutting it on Monday (Memorial Day) and I took one load of wood to Walt who heats his home with wood.. Walt and I cut more wood tonight. I have to haul the brush to the township garage for disposal. That will be a project in itself. The leaner that's left. Rotten at the trunk. Just a matter of time till it comes down. Your's truly - tuckered out. Walt having at it. 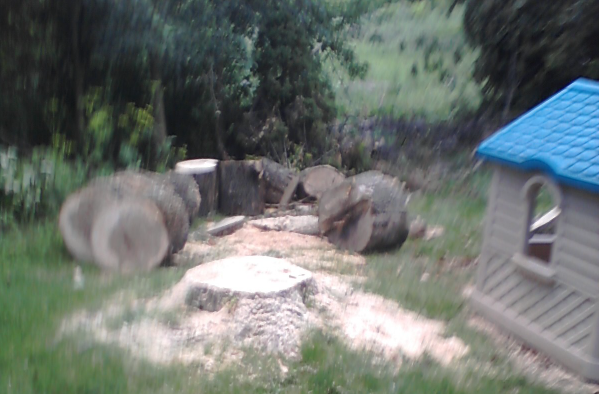 Alex also has a friend from church who had a tree that he wanted cut down. 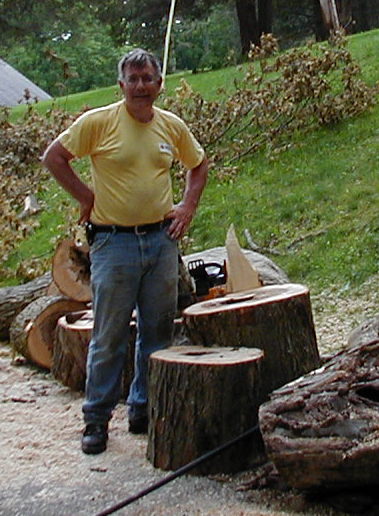 We had cut another one down for him several years ago. It was fairly small and not a big deal. He asked if we would do this tree and we said yes without looking at the tree. 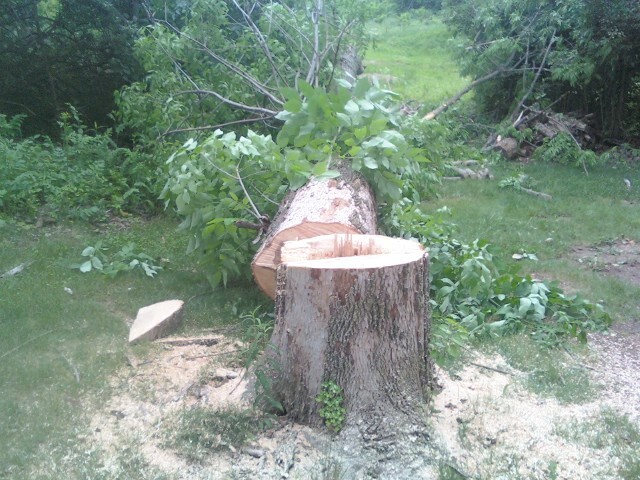 It turned out to be pretty big, but we got it down OK and mostly cut up. Not sure of the diameter. Maybe 28-30 inches. I'll have to measure it. I'm not sure what kind of tree it is. June 5, 2010 - Finished up cutting everything next door including the two limbs hanging in the tree next to the house (broken by the tree that fell). Everything's cut up. 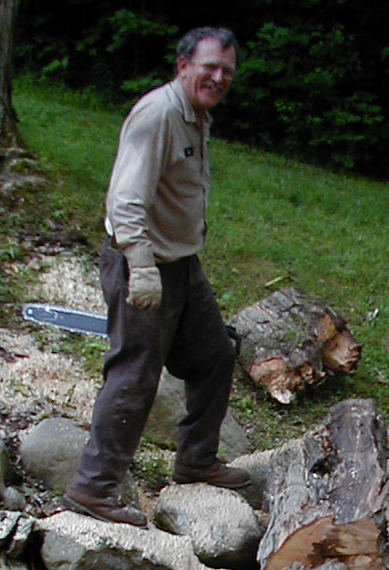 I just have to haul the branches to the dump and Walt has to come and get the wood - probably one pickup load, but some of it will have to be split in order to load it I think. 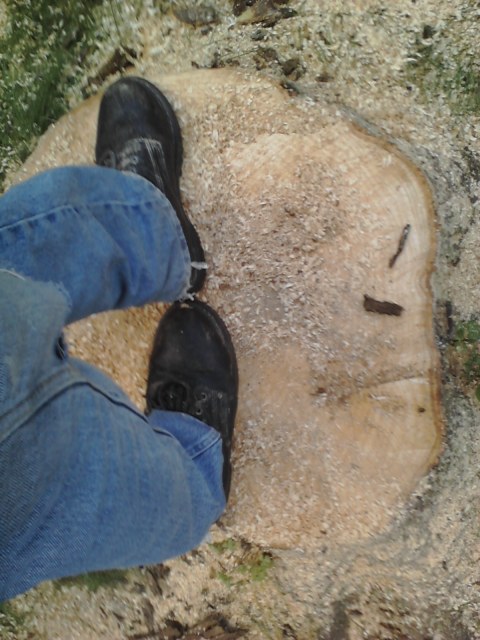 Finally got back over to the tree above to finish cutting up the trunk up. Got it finished up. It was a big one. These were taken with my cell phone. I think the lense must have had a little sweat on it. It was around 90 this evening when we were cutting this stuff.